eJamming presenting during Unconference 2009 startup 10-minute pitching sessions. UnConference 2009 organized by e27 has been awesome, and although it has been more than a week since it was over, the buzz still remains. (Maybe it was all the fallout from my previous post on UnConference 2009). One of Singapore’s first application developers for Facebook and the iPhone, 2359 Media also operates an advertising network for native mobile applications. Presented to the audience was SG Malls, an iPhone application that helps users navigate inside Singapore malls and includes store directories (for all 90+ of them!). Mickey, Wenhan and Hong Ting from 2359 Media. 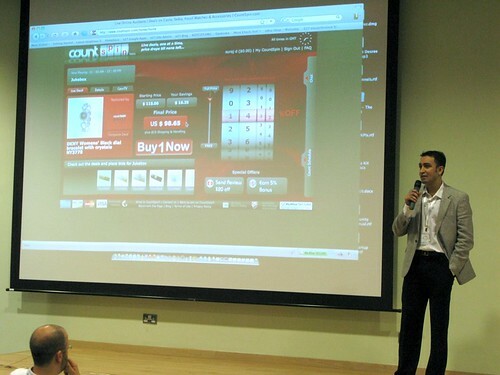 CountSpin features live falling-price auctions on consumer fashion and lifestyle products such as luxury watches and jewellery. Price drops every second till the available quantity is sold out, providing an interesting online retail experience and generous discounts. Countspin was covered in a previous post. Jay Gupta of Countspin presenting during the startup pitches. eJamming AUDiiO is an online subscription-based social network for musicians that allows them to collaborate, create, record and play together online in real time – with a near-zero latency feel on each musician’s instrument. Musicians meet, then create or join live jamming sessions with up to three other musicians anywhere in the world. With JamCastLive, musicians can netcast their live eJamming AUDiiO sessions over the network to fans anywhere in the world. 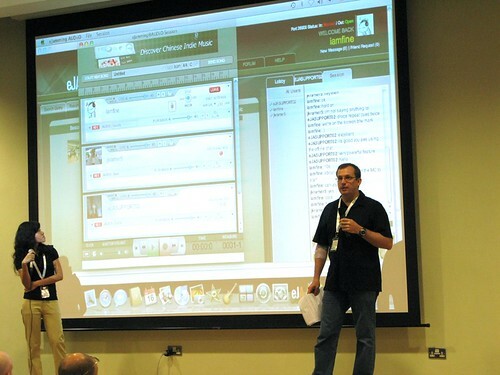 One of the most promising startups present that wow-ed the panel and crowd especially during its live demo. They could do with a better name, though. eJamming presents, sings and plays into the audience's hearts. Frenzoo is the first-ever 3D fashion virtual world, where users (most likely target audience of female tweens and teenagers, none of which were in the UnConference audience) can design and dress their avatars in interactive, animated 3D. The company works with consumer fashion and lifestyle brands, such as Goods Of Desire and May May King and brings their products to 3D virtual life. Founded by CEO Simon Newstead, Hong Kong-based Frenzoo is bootstrapped with funds from the co-founders and creators of Skype, Ambient Sound Investments. You can find out more about Frenzoo in an interview with SGEntrepreneurs here. Not the sushi joint. CEO Ken Brady of Tokyo-based Genkii presented the company’s vision of bringing 3D virtual world technologies to mobile devices, and highlighted Sparkle, the first virtual world for the iPhone. Near-field communications service provider Human Network Labs (HNL) uses a disruptive location-based technology platform for the precise location of nearby objects and people. The platform operates via a peer-to-peer wireless network and does not require any infrastructure such as Internet access, mobile service provider, WiFi or GPS. 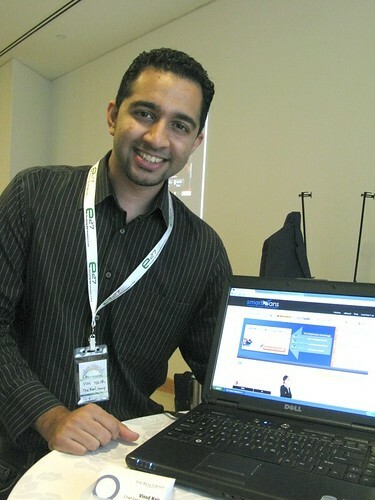 Another startup that impressed, and Twitter was abuzz with the potential applications of such a technology. The iTwin is a novel consumer device that consists of two identical, separable USB parts which allows them to be plugged into different computers to establish a secure connection between both machines. Files can then be accessed on one computer from the other and vice versa, through Bidirectional File Access over the Internet. Many of the audience were intrigued by the device, and if iTwin can overcome various security issues, the device will have tremendous potential. OrSiSo is a next-generation social networking tool that integrates multiple social network sites and instant messenging services to help a user manage their online lives. OrSiSo‘s platform is built around an aggregation engine, an integrated instant messaging platform, as well as an engine that automatically determines the usefulness of a particular piece of information to the user and which adapts accordingly to user behavior, for a rich browsing experience direct to the desktop or mobile. Read an interview with CEO Thorben Linneberg here. Socialwok is an on-demand enterprise social media collaboration platform that provides small-to-medium organizations with a single application platform to manage all their social media (LinkedIn, Twitter, Facebook, and RSS feed interactions) and leverage social messaging to help distributed mobile employees collaborate more effectively within and outside of the organization. It’s unlikely that a small company would allow its employees to participate in social media during working hours (especially Singaporean ones), but Socialwok CEO Ming Yong seems convinced. CareerAlbum is a social career platform that allows jobseekers to easily put together online resumes, multimedia portfolios, and professional networks to manage their careers. 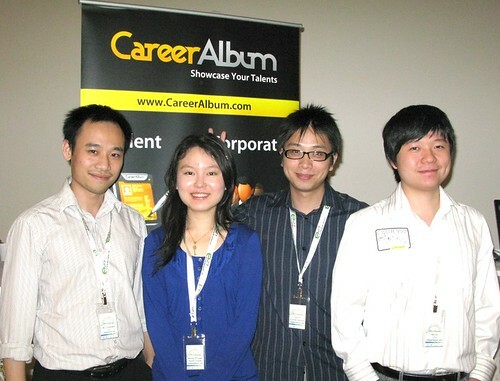 CareerAlbum also provides a comprehensive online suite for corporates – companies, headhunting firms – to hunt for talents, run marketing campaigns, events or competitions. It’s hard to see them beat entrenched players like JobsDB or Jobstreet, but you never know. Kuala Lumpur-based Elevyn is a social entrepreneurship site with a heart – it is a platform for communities, NGOs and entrepreneurs to set up online shops that support a worthy cause. A percentage of the sale of every item sold through these online shops goes directly to fund a chosen cause. You can read a previous interview with Mike Tee of Elevyn here. An audio social bookmarking service, Singapore-based Ffffoundtape lets you discover “missing” MP3s around the web, bookmarking it for later listening, and make playlists to share with friends. Since there’s no transfer of data involved, there’s little chance for Ffffoundtape or its users to get their pants sued off for copyright infringement. Kuala Lumpur-based Foldees is the greeting card version of popular online t-shirt design site Threadless. Foldees.com solicits greeting card designs from the public through various competitions it runs, which it then prints and sells. You can also read a previous interview with Lau Chak Onn, founder of Foldees. Currently under development, Foliohouse is positioned as a community that is targeted at professional and aspiring digital media talent. Foliohouse will take the form of a social network site, jobmatching for the creative industry as well as feature competitions across digital media genres. A Phokki wannabe, perhaps? Hard to tell what their USP will be until they officially launch. A web platform that promotes event sponsorship as an effective and viable means of marketing, JKonnect enables companies to aggregate and compare event sponsorship opportunities based on their characteristics (target audience, demographics etc) to generate a better ROI for their sponsorship dollar. The platform can also recommend event organizers suitable sponsors to approach based on their compatibility with the marketing and promotional needs of the companies. It is currently under development. JK Thng of JKonnect (right). Klout measures a Twitter user’s influence across the social web, and discover people who have the most influential online networks and carry word-of-mouth. During a demo, I saw the names of those who influence me the most on Twitter, as well as those I influence, plotted on a graph. Very nifty, and I can see how this service will help those in the social media and marketing space. 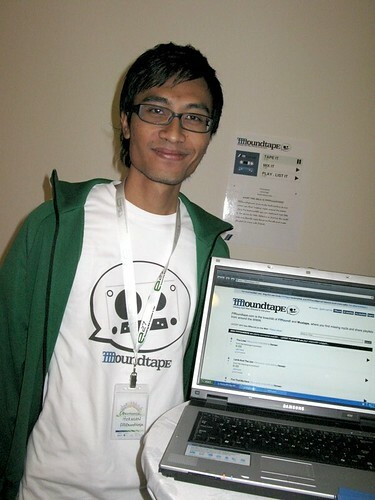 Read an interview with Jonathan Chua, a co-founder of Klout, over at SGEntrepreneurs. 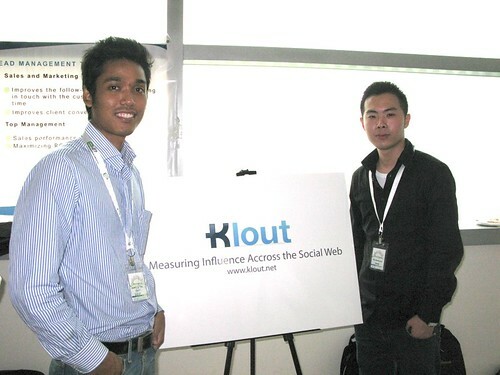 Kevin and Aung from Klout. Mobile Sorcery provides MoSync, an integrated collection of tools for application development for mobile, handheld devices. MoSync is a cross-platform tool that allows the easy porting, updating and creation of applications from one mobile platform to another (Windows Mobile, S60, Java, Android etc), which can radically cut application development time and cost across different mobile platforms. SmartLoans is the first-of-its-kind, free-to-use online mortgage comparison service for the Singapore market that allows users to easily search for, compare and enquire about home loan packages available across eight different Singapore-based banks. It utilizes advanced web technology to intelligently filter, calculate and tabulate results to a single page for easy comparison. SmartLoans was covered in a previous post. 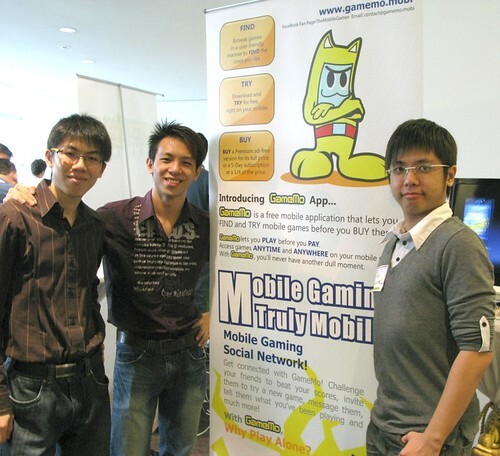 TheMobileGamer (TMG) aims to makes mobile gaming truly mobile. Its free mobile application GameMo, allows users to try mobile games out before they pay for them, direct from their mobile devices. It is also a gaming social network. Interviews with Klout, Ffffoundtape, TheMobileGamer (TMG) and SocialWok are on the cards. Unfortunately I wasn’t able to talk to every single startup present at the UnConference this year. If I have missed you out, please drop me an email and I’ll be more than glad to give you a shoutout. 4. 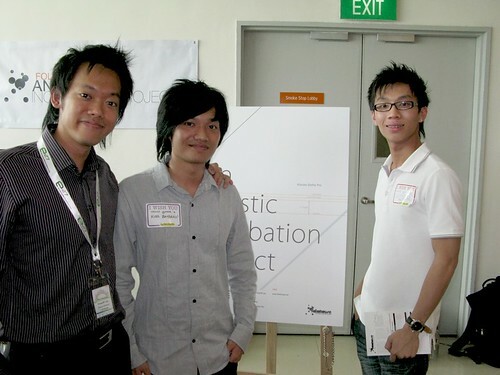 “UnConference 2009 Singapore” by FreshBakedWeb.